The get together began the morning of 5th in Lumezzane with Mass, after which we got on the road to our destination. 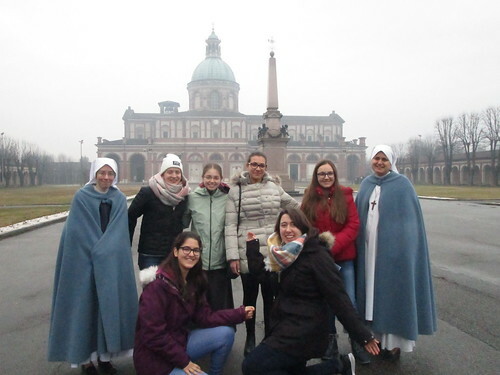 When we reached Brignano and greeted the Lord of the House in the Chapel, and the Sisters of the community of Brignano, we situated ourselves a little and gathered for the first meeting. It was an introduction to the theme of the get together. Starting with the phrase of the Gospel that says, “Heaven and earth will pass away but my words will not pass” (Mt 24:35), we understood, helped by other passages of the New Testament, some of the promises that The Lord made to us and how God is faithful to his promise. Above all we were impressed by the promises concerning Eternal Life for those who are faithful to God and persevere. Another phrase that impressed us was, “your names are written in heaven.” We reflected on how the world can promise us many things, but only God promises really great things and He alone is faithful to his promise. Thinking about God’s promises and his faithfulness has made us also think about what we ourselves should promise God, what our response should be, and realize that we cannot do anything on our own. With Him everything is possible. 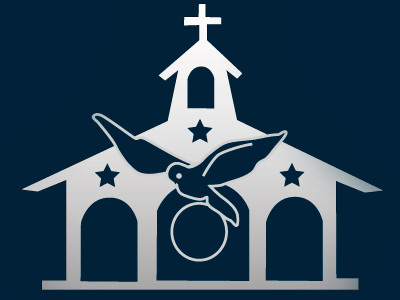 After the introduction of the theme we went to the chapel to pray the Angelus. Then it was time for lunch. After recharging our batteries with a tasty plate of pasta, we went to the sanctuary called Madonna dei campi (Our Lady of the Fields) and prayed the Rosary. Once we arrived, we sang songs to the Virgin Mary and had prayer time in which we could think of the Virgin Mary as “The Mother of the Promise”, Promise with a capital P, because She is the Mother of Jesus, the Promised Savior. In our prayer we asked Our Lady to help us realize the greatness of God's promises to us if we are faithful, and the strength to say our yes, our fiat. Once back at home it was time for the film. We saw a classic: A Man for All Seasons. It's a movie that deals with the life of St. Thomas More. In him we were able to see a man who was, far above any human price, faithful and loyal to God. We reflected on how man himself is very weak, but we saw in this saint how the strength of God overcomes human weakness. Then it was time for dinner. But, what are we going to eat? It was our turn to prepare dinner. 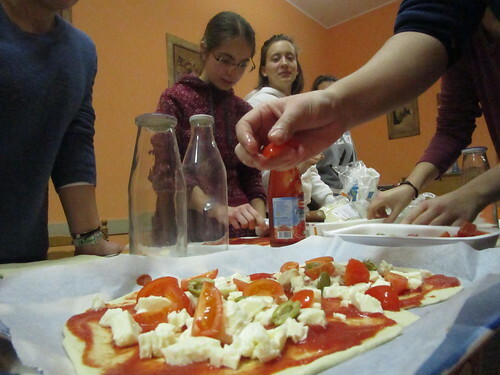 We made some great pizzas, bringing out the best of our culinary talents. After dinner, we spent some time together followed by time in the chapel for a final reflection on the day lived together. We thought about what we talked and reflected upon, we prayed the "Hail Holy Queen" and went to sleep to prepare ourselves for the next day. On January 6, the Epiphany of the Lord, we got up and found that the Magi had come that night leaving us a gift! After breakfast we drove to the Sanctuary of Caravaggio – St. Maria de la Fuente. We went to Mass in the sanctuary and then took advantage to go to Confession and have time for prayer in front of the image of Our Lady. We saw the Nativity scene and went down to the fountain where the Virgin Mary appeared. It is always a grace to visit places of apparitions and spend time with Our Mother. Then it was time to go home for lunch. After the meal we had time to sing, be together, and pick up a few of our things. At three o'clock we joined the parish for the living Nativity scene organized by the parish priest and the sisters of the community of Brignano. We enjoyed very much listening and seeing the history and mystery that we had contemplated at Christmas interpreted before our eyes, accompanied by songs. We couldn't forget a cup of hot chocolate at Brignano's oratory at the end of the event. After that then it was time to go back to Lumezzane. We made the most of the trip back to Lumezzane to talk about the graces received and what we learned at our get together.